I am not the biggest football fan out there. However, while watching a game one time, I realized there are a lot of lessons us direct sellers can learn about building a successful direct sales business by watching the game. There is no doubt that in order to be a full-time football player that you have to have a commitment to the game and passion for it. Without those 2 attributes it will be hard, if not impossible to have lasting success and happiness in any sport you play or when it comes to building a successful direct sales business. Are you committed to reaching your goals? Do you have a long term vision for what you want to achieve? How passionate are you about what you do and why you do it? That commitment and passion are what will keep you going even when you lose a game or have a bad season in your business. Practice & continually developing your skills. Football players spend way more time practicing playing the game than they do actually playing in the games. Without that practice, they won’t know the plays, they won’t know how to work with their team or how to beat their opponents. Practice for football also helps provide the mental and physical conditioning necessary to win. It is the same with your direct sales business. If you don’t develop the skills of a successful direct seller and practice those skills on a regular basis, you will lose more than a game, you will lose your confidence and miss out on chances to grow your business. When you work your business consistently it also will help you to be ready when opportunities come your way so you can make the most of them. Having a plan and strategy. Football players don’t just get out there and play for funsies. They have plays, strategies and plans in place of who is going to do what, go here and there and work through different scenarios during the game. Working smarter and getting more results starts with having a plan and systems in place for your direct sales business. Goal setting, having milestones, scheduling in time to work your business and knowing the tasks you need to do each day, week and month and then actually doing those things are key to building a successful direct sales business. Football is not a solo sport. It takes an entire team to win the game. Everyone has a different position they play and different skills they bring to the game. They have to work together to win the game. I think the best reward of having your own direct sales business is the support, friendships and team environment you get to be part of. When we all work together towards similar goals, use our own personalities and skills to empower and uplift each other, amazing things can happen for everyone in the team. Giving it 100% regardless of the odds of losing. One thing that has always fascinated me about sports is how players are able to go into a game and still give it 100%+ while knowing that they only have a 50% of winning the game. Only 1 team can win, there is no way around that. Yet they go in and give their all regardless of the odds. In a direct sales business, we are going to get a lot more no’s than we will ever get yeses – whether that’s for booking parties, recruiting or selling our products. I see so many direct sellers give up too easily or let that fear of being told no keep them from even trying. Imagine what would happen and how much you could increase your odds of “winning” or getting that “yes” if you went into every situation and conversation with the mindset that you were going to give it 100% and play to the best of your ability regardless of what the outcome or chance of “losing” or getting a no was. If you ask people and talk to people you still have a 50% chance of getting a yes. Watch any football game and you will lose count of how many times the players get tackled and knocked to the ground. Yet they keep getting back up and going for more! The best football players know that they are going to get knocked down, that they might not win every game or get the results they want every single time, but they keep practicing and keep playing. Their mindset is focused on doing what it takes to win. They realize that success is more than just the outcome of one game, it is an entire season. Our direct sales business is the same way, it’s not a sprint, it’s not just one game. It is a marathon, it’s an entire season or many seasons over our career that define whether we are champions or not. Having a winning mindset and always being focused on learning, growing and improving as a direct seller, business owner and a person can make all the difference in whether we reach out goals or not. 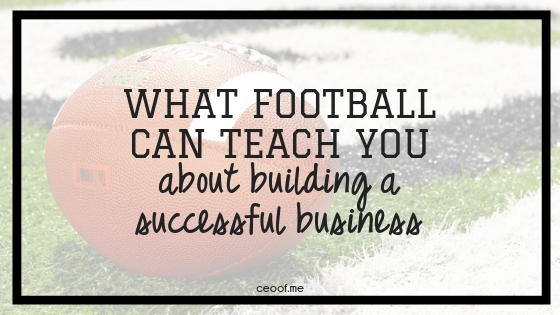 What other business skills do you see football players exemplifying? If you enjoyed this post, I would appreciate if you would comment below and share it on social media. Thank you! Well said, Misty! Every point you talk about makes complete sense! Will definitely share this on my FB business page. I’m so excited to share this blog with my husband, Scott Shaw. He just became an independent Mary Kay Consultant and really does want the pink Cadillac. This will give him a great boost. You are awesome! Thanks Whitney! Good luck to your husband Scott too!! As always, you are spot on! This really encourages me to keep going this week when I have been doubting myself, my skills and my decision to go into direct sales. Thank you for always knowing *exactly* what to say!